In the hills here there are a lot of snakes but by luck we haven't run into any in the last few years. This year though, I've had 3 close encounters with snakes in a 3 week period at the beginning of the hot season, 2 just up the road from here in some bushland behind Kalamunda Glades Shopping Centre, the other in Jurien Bay on a path through some bush behind the beach. The snakes near here were both juvenile dugites (I think), both times they were soaking up the sun on the path when I nearly stepped on them. Only after stepping over/around them did they move on, so sluggish were they. The first time it happened I started watching the path more closely as I walked along, but the 2nd snake I also failed to see despite watching, because I was watching the path a couple of meters ahead. I've now come to the conclusion that you need to watch where you are putting your feet, so look down, look down always. Ofcourse this puts a real downer on bushwalking. We encountered the Jurien snake while riding bikes along the bush track next to the beach. The kids went through about 10 metres ahead of me. The snake crossed the path right infront of my bike and had I not braked I would have hit it with my front tyre. Our dog jumped out of the basket to have a closer look but luckily the snake had gotten across the path & into the bush by then, and I had a hold of the dog by her lead. The snake was long & almost black, either a Gwardar or Dugite probably, after talking to some locals about it. Very scary experience, almost put me off going outside! Now 3 close encounters in 3 weeks has got to be the universe trying to tell me something, so I took notice & did some calling to CALM, read some books & internet sites and here's my advice to anyone who lives around here and isn't prepared. 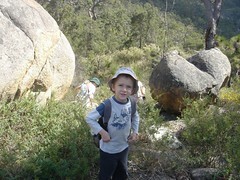 My advice when bushwalking in summer - please be prepared. Hey I'm no expert but here's my 2 cents. Snakes are out and about all summer but in my opinion the huge danger time is the first few weeks of heat when the snakes are coming out to warm up - they're everywhere & they're in the clearings (like paths) where it's sunny and you are walking. They are sluggish and do not get out of the way as quickly as you might think at this time of the year. Very easy to step on them even if you're alert because they look just like a stick! The colouring of dugites is very variable and they tend to take on the colour of the surrounding bush ofcourse. In midsummer it is also dangerous but atleast the snakes probably move away faster when they sense you coming. Now I'm talking mainly about dugites - they are shy snakes and will keep away if they can, on the other hand tiger snakes are agressive - I am very glad we don't generally get those around here (touching wood). Talking of other poisonous snakes I believe we also get a kind of death adder around here that likes to hide in mulch - sounds wonderful doesn't it - a good reason to stick to cleared paths. If you must walk in the bush in summer then take a backpack with a charged mobile phone, and a large compression bandage, (PUT A BANDAGE IN YOUR BACKPACK NOW!) just in case. Also wear closed in shoes and long pants, boring I know. I have taken to using the roads rather than the bush tracks to bring the kids home from school as they are in sandals and shorts & after my experiences this year I can't bear the thought of their little ankles exposed. Look down at your feet all the time, you must look ahead also ofcourse but believe me, it is very easy to miss a snake that is lounging in the sun so I reckon you've got to be super aware. If you encounter a snake, act non-threatening, back off calmly & wait for it to get away. first wrap the limb from the site of the bite, then down the limb, then back up the limb if you have enough bandage. Firm but not tight enough to cut off circulation - the idea is to slow down the passage of the venom (through the lymph system I believe). Please keep in mind I'm no expert, but I believe that's the correct way to apply a bandage. Second, immoblize - don't walk. Sit or lie down & wait for help. Third, ring an ambulance and give them clear directions to find you - do not let the victim walk. Ofcourse if someone can carry the victim to the nearest road that might make sense. Do not wash the bite site - that might be needed for identification at hospital. Don't remove the bandage either, that would free up the circulation. Snakes in WA are rightly protected by the Wildlife Conservation Act so don't try & kill one. Don't get paranoid. It will probably never happen, but for goodness sakes, go buy a bandage & put it in your backpack now! And if you have a mobile phone then take it with you when walking alone. Also remember that the European honeybee is more likely to kill than a dugite, and that only a small proportion of snakebites actually cause illness as the fangs often don't penetrate far enough. But for this reason too children & dogs are more vulnerable so you need to take snakes seriously if walking with little ones.